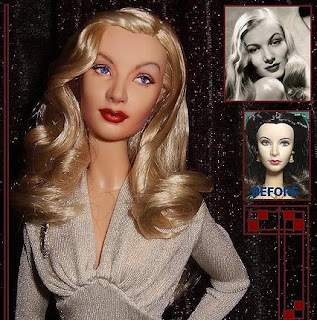 Like most OOAK artists, Cyguy works with existing doll head molds, stripping off the original paint and repainting them, but he also, particularly when dissatisfied with the result, may sculpt a new head and cast it in a mold. 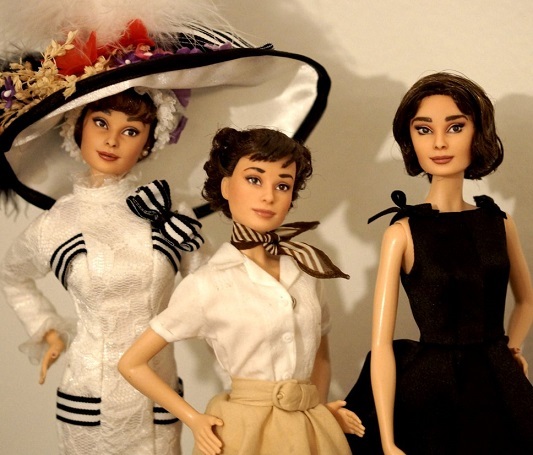 Cyguy's very-in-demand dolls sell for as much as $1,500 each. Cyguy's creations are also on display on Facebook. Click here for a May 2017 interview with Cyguy in Vogue Italia. 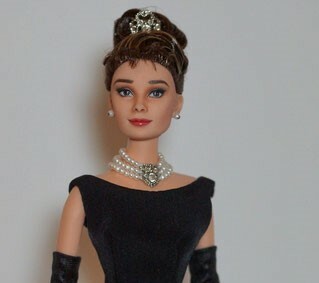 Last December, Melissa of the Everything Audrey site posted "The Ultimate Guide for Audrey Hepburn Gifts for Christmas or Birthdays." In her lengthy feature, she included photos from and a link to the website of OOAK doll artist Lulamee (please note, Holly Golightly's real name was Lulamae). 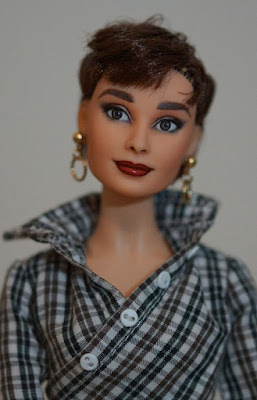 Of Lulamee's work Melissa wrote, "Look at the enormous amount of detail and care that she puts into these dolls to make them look just like Audrey. All I can say is wow." 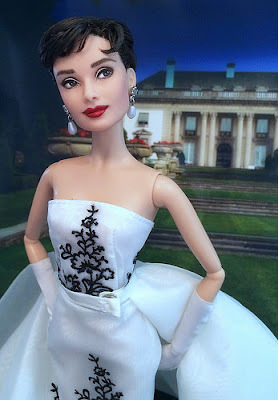 Lulamee's Old Hollywood muse is Audrey, though she also creates dolls based on contemporary celebrities and animation characters. She is a proud member of the Repaint Society and showcases her work (as Lulamee) on Instagram and Facebook as well as her on own website. Kim Goodwin is a make-up artist with the Cloutier agency who, during his career, has worked on famous faces such as Elizabeth Taylor, Sharon Stone and Charlize Theron, to name a few. 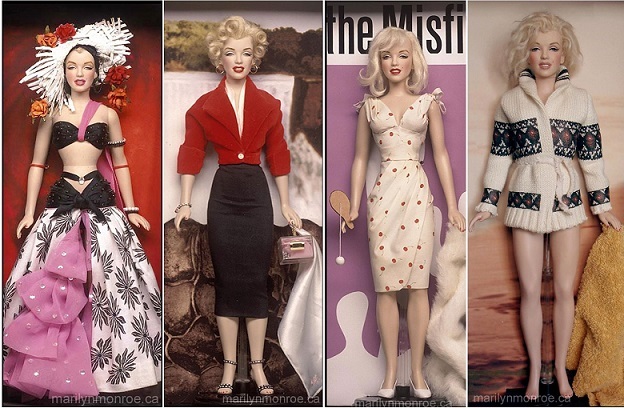 Goodwin began creating his own OOAK Marilyn Monroe dolls because he felt the tribute dolls being produced by established manufacturers were not up to par. 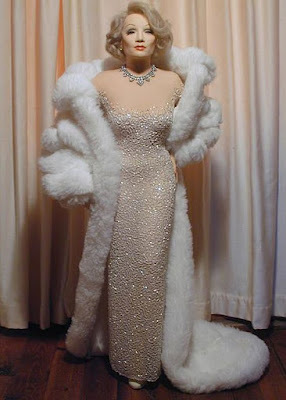 He begins his work by stripping and repainting Franklin Mint dolls, then adds hair and recreates specific costumes and accessories Marilyn wore in her films, at public events and in photo shoots. Kim Goodwin's OOAK Marilyn Monroe dolls were selling on EBay 15 years ago for $700 and more, and their value has only risen since then. Click here to view a gallery of Goodwin's Marilyns. Clark Hanford is not a typical OOAK doll artist, but an artist/artisan in Westport, Connecticut. 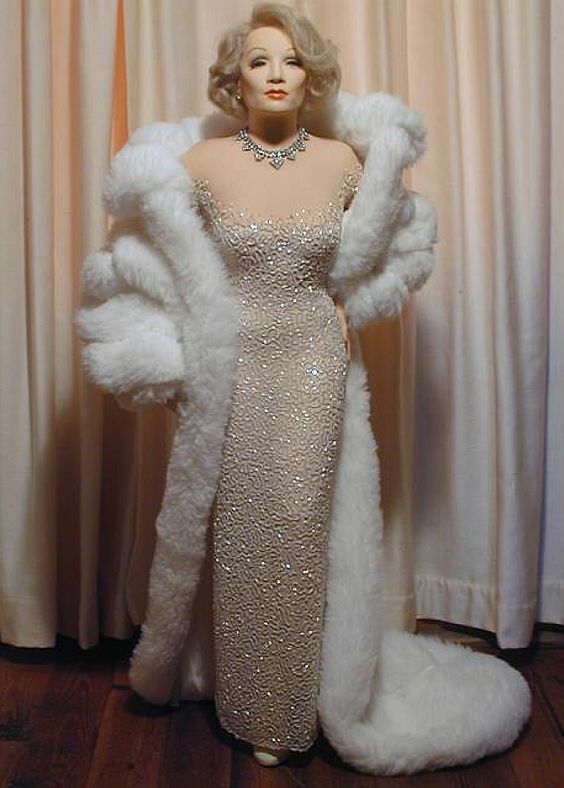 Hanford's stunning rendition of Marlene Dietrich, gowned-to-the-teeth during her concert years, is so realistic that it appeared and was credited in a print publication as a photograph of Marlene herself. Before moving to Westport, Hanford lived in London for many years, where he sold his work in Notting Hill. 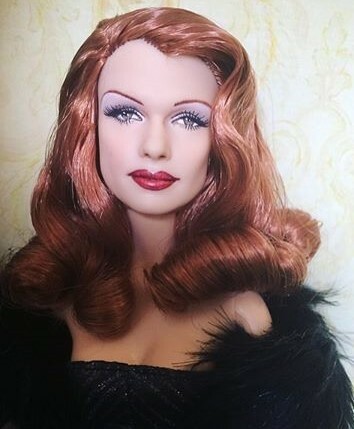 Along with creating sconces and painting portraits, Hanford crafts 34" figures of Golden Age stars like Marlene, Lucille Ball, Katharine Hepburn and Frank Sinatra. 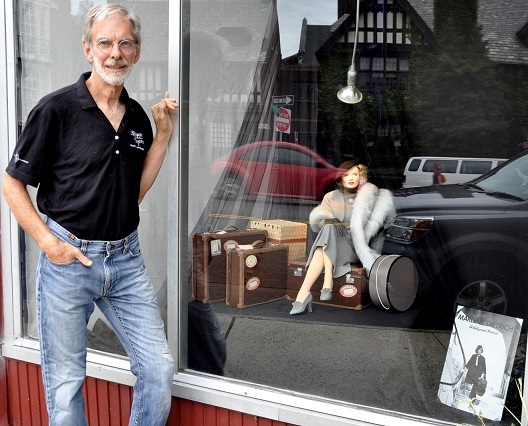 His creations are handmade to order and outfitted in costumes he also makes himself. I am in awe. Thank you for introducing me to a whole new world. Such great work. I of course focus on the costumes and they are so accurate as well.This of course makes the look, but as a miniature is hard to produce. Thank you Lady Eve for introducing us to this fabulous work in your excellent series. Agree that the intricate costume work makes the final look of these creations, Christian. I so admire the care that goes into the making of each figure. 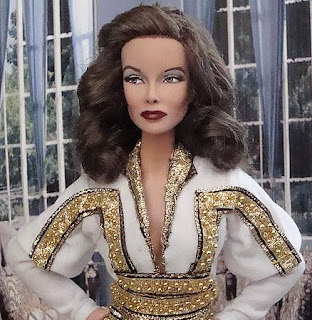 I remember seeing this doll seated and dressed differently at a pub in Notting Hill in the late 70s, I had never seen anything like that and even asked for the price, that's how much I wanted one. Unfortunately, it was not for sale. Apparently this is where those dolls originated. They were so accurate and really looked like the celebrities. 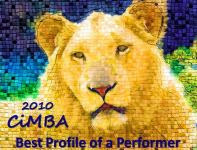 There was also one of Garbo that I loved even more... They are so well done, all the details and the craftsmanship are amazing. Thank you for showcasing them and their talented creator. Thanks for stopping by, Linda. It's great to hear from people like you who really appreciate not only the work but also the standard of perfection these artists put into their craft. 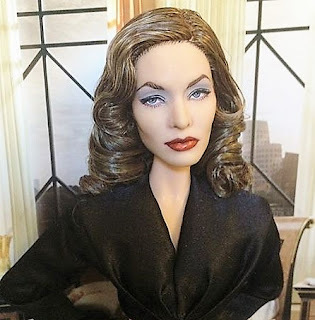 It was the Clark Hanford "Marlene" that piqued my interest in these celebrity recreations in the first place, by the way. I only wish you'd been able to buy the doll you saw in Notting Hill.